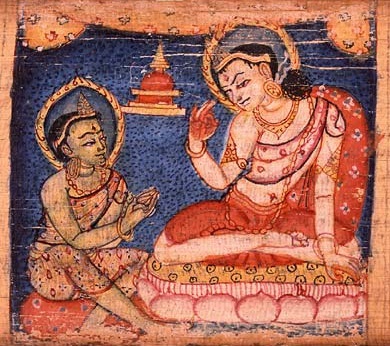 The Mahayana Gandavyuha-Sutra( (Skt. Gaṇḍavyūhasūtra, Wyl. mdo sdong po bkod pa; Sutra of entry into the area of reality) is regarded as a forerunner of the Avatamsaka Sutra into which it was integrated as chapter 39. An inscriptional text of it accompanied by paintings can still be found today on the temple walls of the monastic complex at Tabo dating to the tenth century. Scenes depicting the complete narrative of the Gandavyuha Sutra were carved into the gallery walls of Barabudur in the indonesian island Java. The original Sanskrittext from the second century had chinese translations(chin. Dàfāngguǎng Fóhuáyán Jīng, Huayan jing) and a tibetan translation(wyl. mdo-phal-po-che ) in the 9th century and nowadays english translations of japanese translations of the original sanskrit as chapter 39 of the Kegon-Sutra (jp. Daihōkō Butsu-kegon Kyō; Hua-Yen-Sutra , Avataṃsaka-sūtra) u.a... The translations of Thomas Cleary are from chinese translations and not as original as the Kegon - translations. 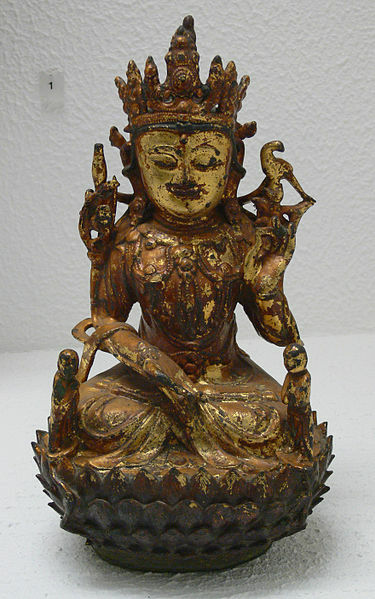 The Gandavyuha-Sutra is a Mahayana - text with the bodhisattva - ideal. It includes the pilgrimage of a pilgrim named Sudhanakumâra to 52 spiritual friends (kalyanmitra) and counselors with the goal of cosmic enlightenment. Sudhanakumâra ('Child of wealth ; Shàncáitóngzǐ; Wade–Giles: Shan-ts'ai-t'ung-tzu) is in China better known as Sudhana('Red boy') and as Shancai or Shancai Tongzi. The sutra spread in the asiatic region until Indonesia. In China Sudhana is sometimes being assigned to Longnü, the daughter of the Dragon King. The sutra became one of the fundamental texts of the Hua-Yen scool. After this as 53th step the Samyaksambodhi (absolute universal enlightenment), the last miraculous enlightenment of Samantabhadra, comparable with the Sahaj-Samadhi. The word gaṇḍa has also the meaning of 'language with double meaing'. Already D. T. Suzuki proposed to look at the Gandavyuha - Sutra as description of the unfolding and expanding consciousness of a seeker. The Sutra describes steps 1 to 19 auf the universal path in a secret language embedded in stories. The chinese LongNü can be seen as the awakened und cleaned prana-kundalini - of the aspirant ! * Fontein, Jan (1967). The pilgrimage of Sudhana: a study of Gandavyuha illustrations. Walter de Gruyter. ISBN 978-3-11-156269-8.